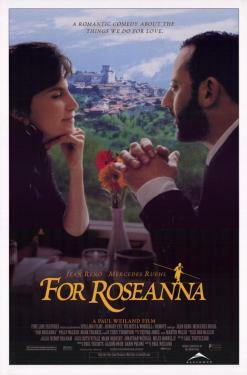 Steeped in the timeless beauty and warm sensuality of a small Italian village, "Roseanna's Grave" centers around the comic dilemma of Marcello, the town's beloved trattoria owner whose ailing wife, Roseanna, has but one wish should she die: to be buried in the bosom of her family in the tiny local cemetary. Devoted to his wife, Marcello must nonetheless cope with the fact that there are only three remaining burial sites in the graveyard and lots of ill and elderly (not to mention accident-prone) townfolk who threaten to beat Roseanna to the hereafter. And so Marcello is forced to go to increasingly extreme lengths to keep everyone in his village alive, well, and out of his wife's intended graveyard spot.